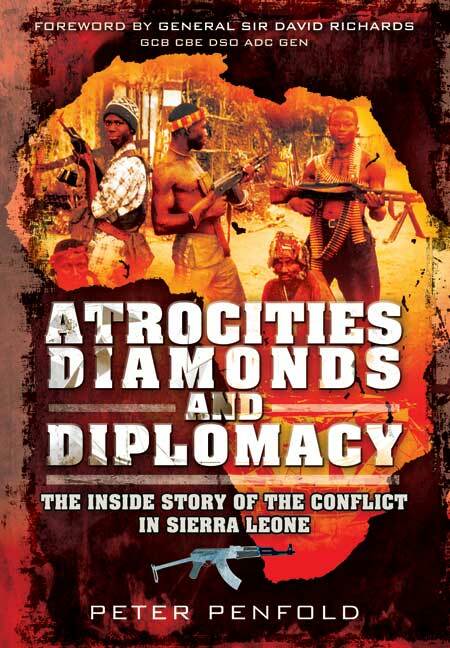 You'll be £19.99 closer to your next £10.00 credit when you purchase Atrocities, Diamonds and Diplomacy. What's this? Order within the next 5 minutes to get your order processed the next working day! In early 1997 Peter Penfold, arrived in Sierra Leone as the British High Commissioner. This fascinating book describes not just his eventful three year tour but the background and subsequent events that placed this small country at the centre of the world stage. During his tour he found himself as right hand man to the country's beleaguered President Kabbah. Due to rebel actions, including shocking atrocities, the Author had to not only evacuate the international community (twice) but was forced out himself. At times he flew in daily from British warships as the situation was dangerously unstable. We learn how almost immediately after being praised by Prime Minister Tony Blair for his pivotal role in getting this once rich country back on its feet, he found himself under Customs and Excise investigation and Parliamentary Committee scrutiny for his supposed role in the 'Arms for Africa' Enquiry. While reprimanded by the FCO, he was feted and made a Paramount Chief by the Sierra Leone people. He describes how, after his tour was cut short despite his and the host Government's appeals, the situation again deteriorated. He gives a highly informed account of the subsequent events including the SAS Operation BARRAS – the rescue of the British military hostages. This is a very important account based on the most privileged knowledge. Practically everyone Penfold met in that war-torn land had experienced some form of tragedy, so he did whatever he could, whenever he could, to help, sometimes flying in from British warships to engage in relief work relative to food, housing and public health, and demonstrate practical concern for those who suffered disabling injuries during the conflict, with a view to restoring their dignity and sense of purpose in life (see pp. 123; 129-130 and 136). It is here that the author shines. Penfold has written a book on his Sierra Leone experience...that is both remarkable and compulsively readable. Remarkable, because it is rare for British diplomats to write memoirs in which they unburden themselves of their feelings, passions and resentments...It is also extremely readable in part because Penfold, as a diplomat who left with a largely unjustified cloud over his name, manages quite a few indiscretions...He also manages to write in an informal chatty way, which makes the chapter where he recounts the seriously appalling atrocities that hit Freetown in 1999, after the renewed attacks from the RUF, all the more shocking. Peter Penfold's very welcome book gives unrivalled insight into the struggle to restore democratic government in Sierra Leone against a background of civil chaos. It is an insider's narrative, and while first person accounts of the fly-on-the-wall variety exist, describing a country's critical hours, few have been written by an insider who played such a key role in supporting democracy. In this outstanding chronicle of a country plunged into chaos and re-emerging stronger, its author writes with no bitterness and no strident self-justification of his own actions but rather in, what this reviewer at least sees as, the best tradition of the British Civil Service: with frankness, a light humour, self-deprecation and a readiness to give others due credit. The appalling civil war in Sierra Leone took place between 1992 and 2002. Between 1992 and Penfold's arrival in early 1997, 15,000 people had already been killed and much of the countryside devastated. Peter Penfold writes this honest overview of his three year post in the country as British High Commissioner, including the events that elevated the country's internal plight to the world headlines. This recent and most detailed publication provides a valuable and informative read about the colourful recent history of one of the poorest countries in the world, and which still experiences the after-effects of the war. This book by the former High commissioner to Sierra Leone is a must read for anyone interested in African affairs. The title highlights his close relationship with the president and his passion for a state that ultimately cost him his job. This is a well informed and well written memoir. This superbly well-written, well-documented and passionate book should be read by everyone interested in Africa, as well as in the grave issues of war and peace. Peter Penfold CMG OBE enjoyed a hugely successful diplomatic career. He retired shortly after his standing down as High Commissioner but is a frequent visitor to, and well respected figure in Sierra Leone. He testified at UN Sierra Leone War Crimes Court. He lives at Abingdon and is available for interview.